Gagik Tsarukyan gives a speech for the Prosperous Armenia party in 2014. Image still via: Hamlet Kirakosi / YouTube. Some rights reserved. He is Gagik Tsarukyan. After more than two decades of incumbent victories and associated claims of fraud and protests, for many Armenians, Tsarukyan is the “change” candidate in parliamentary elections on 2 April, and his party is currently leading in polls. Tsarukyan is running on the universal populist promises of jobs, lower taxes and patriotism — none of the high-brow ideological rhetoric. Tsarukyan speaks in short, simple bursts, often referring to himself in the third person. His trademark wear is white suits with bright-coloured turtlenecks, as favoured by the post-Soviet gangsters of the 1990s. He also has a natural charisma that many people can connect with. Tsarukyan’s popular appeal seems odd in a country where powers that be — the government and business elite — are typically loathed. While Tsarukyan’s popularity is real, is he in fact an alternative to Serzh Sargsyan’s Republican Party? Or is Tsarukyan’s campaign a charade intended to shield the elite’s vested interests? Now 60 years old and long a household name in Armenia, Tsarukyan was already a prominent businessman when he was first elected to parliament in 2003. Although the family business was named the “Armenia” Closed Joint Stock Company, its beginnings were humble. Living, as they still do, in Arinj, a community of about 6,000 residents between Yerevan and nearby town of Abovyan, the Tsarukyan family have run several small businesses since the 1980s, growing flowers, producing dairy products and clothing. In 1989, Gagik Tsarukyan is said to have received a college degree from the Yerevan Sports Institute. It is unclear if he attended classes or just bought the diploma, what is certain is that he was already 33 years old and a competitive arm-wrestler. Around that time, Tsarukyan married a local girl, Javahir, and they now have four daughters and two sons. Tsarukyan’s official biography makes no mention of what he was up to between finishing high school and starting a family – a full decade later. Gagik Tsarukyan’s villa, on a hill overlooking the village of Arinj, Kotayk Province, Armenia. Photo CC-by-1.0: Arshavir / Wikimedia Commons. Some rights reserved. One persistent claim is that while working as a traffic cop back in Soviet days, Tsarukyan was charged with a serious crime and did time in a prison for former law-enforcement personnel in Nizhny Tagil, Russia. Tsarukyan is said to have earned an early release and later had his criminal record expunged by the Supreme Court of already independent Armenia. 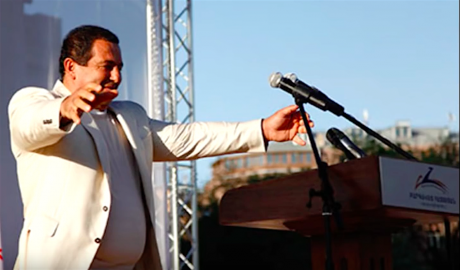 Armenian media claimed that the authorities have used this past conviction to blackmail Tsarukyan, forcing him to moderate his anti-government rhetoric and stay out of the 2013 presidential elections. By the mid-1990s, as Armenia’s economy was in virtual free fall, the Tsarukyans launched the first commercially successful Armenian beer brand, Kotayk, having bought a production line from France’s Castel Group. With those initial profits, they began to buy up state assets slated for privatisation, anything from furniture to pharmaceuticals. But the real turning point came in 1998, after Robert Kocharyan’s election to the presidency in Armenia. Since that year, Tsarukyan began picking up key state contracts, such as servicing the national airline and the military, and a greater slice of key business deals including sales of gasoline and natural gas. It likely helped that Tsarukyan was friends and business partners with Kocharyan’s brother Valery, who, after becoming disabled during the Karabakh war lived in Balahovit, a community near Arinj. Valery died in a hang-gliding accident in 1999, but his daughter Irina continued to work for Tsarukyan’s businesses. As the Armenian economy recovered throughout the 2000s, Tsarukyan was one of the main beneficiaries. His holding (now known as Multi Group) bought the Ararat cement plant, the Ararat brandy plant (not to be confused with the Pernod Ricard-owned plant that produces Armenia’s famous Ararat brandy), and built hotels and casinos. Since Tsarukyan gifted shares in some of these businesses to relatives of Kocharyan and president-to-be Serzh Sargsyan, they were unhindered by tax inspections. Tsarukyan also expanded beyond Armenia, investing in Bulgaria and Belarus (he’s a good friend of Aleksandr Lukashenka), and selling his construction products as far as the United States. He also established family ties to key figures in Armenia’s business and political elite. One of his daughters married the son of Hovik Abrahamyan, one of Armenia’s most powerful officials of the last decade and a half. (Earlier this year, Abrahamyan left the ruling Republican Party and his son is running on Tsarukyan’s ticket.) Another daughter married the son of Andranik Manukyan, one-time leading car importer, transportation minister and in recent years Armenia’s ambassador to Ukraine. But Tsarukyan also occasionally exhibited an independent streak. In 2008, he refused to buy a mineral water plant that the government stripped from Khachatur Sukiasyan, the richest Armenian businessman of the 1990s. Officials cited unpaid taxes in what was a clear case of retribution for Sukiasyan’s support of ex-president Levon Ter-Petrossian’s election campaign. Tsarukyan made clear at the time that he would not be raiding the assets of a fellow oligarch while he was down. Tsarukyan began to spend generously on charitable projects well before others from Armenia’s newly rich oligarchic class. He began local, renovating the Arinj school he attended, paying tuition for Abovyan area students and for medical procedures for those who could not afford them. Amid the embarrassment of the 2004 Summer Olympics, when Armenia failed to win any medals, Tsarukyan became the head of the National Olympic Committee and its chief sponsor. Soon, the country’s traditionally strong wrestlers and weightlifters began to win medals again, and Tsarukyan was there to share the national limelight. Adding to publicity were media companies controlled or funded by Tsarukyan, including Kentron TV and Aravot daily. 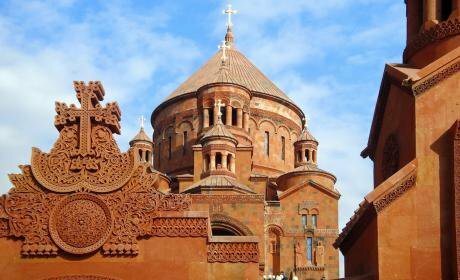 The monumental St. John the Baptist Church in Abovyan, Kotayk Province, Armenia. Consecrated in 2013, its construction was funded by Gagik Tsarukyan. Photo CC-by-2.0: Vahe Martirosyan / Flickr. Some rights reserved. The untaxed income pouring into charity soon began to pay off, when Tsarukyan launched his own political party, Prosperous Armenia. He won about 15% of the vote in the 2007 elections and about 30% in 2012. The party was seen as a political vehicle for Kocharyan and many observers pointed out that its success was thanks to outright electoral bribes. Tsarukyan remains faithful to his electoral strategies. Campaigning in one Armenian province last week, he was approached by dozens of potential voters seeking financial assistance, and promised to help them all. Between 2007 and 2012, Prosperous Armenia was part of the Republican-led coalition, but as Kocharyan’s relations with Sargsyan soured, Tsarukyan refused to re-enter the coalition after the 2012 election. 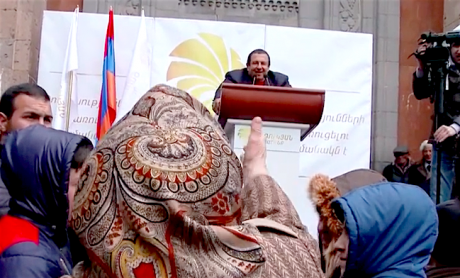 Seating out the 2013 presidential vote, Tsarukyan announced plans to oust Sargsyan through street rallies. In early 2015, he abruptly cancelled the campaign after Sargsyan launched very personal verbal attacks against him. Mediation from influential Russian-Armenian businessmen, including billionaire Samvel Karapetyan, reportedly helped put an end to the confrontation. Through all this Tsarukyan remained the single most popular political figure in Armenia, as polls consistently confirmed. This strength has been recognized by other political groups. In recent years, leading opposition candidates in the last three presidential elections — Raffi Hovannisian, Levon Ter-Petrosyan and Stepan Demirchyan — have all sought alliances with Tsarukyan. Arman Musinyan, a spokesman for Ter-Petrosyan’s party, declined to discuss Tsarukyan when reached for comment. Vahe Enfiajyan, a member of parliament from Tsarukyan’s party, also declined to respond to questions for this article. What is clear is that Tsarukyan’s popular appeal reflects the public’s thirst not for democracy and rule of law, but for a caring, paternalistic “daddy state” and “one of us” charismatic leadership that has been absent in Armenia since independence. While Russia has its Vladimir Putin, Turkey – Recep Tayyip Erdoğan, Azerbaijan – the Aliyev dynasty, and now Georgia – Bidzina Ivanishvili, none of the three presidents of Armenia have projected a similar mix of authority or enjoyed similar levels of public support. A man of the people. Gagik Tsarukyan gives a speech before his supporters on 16 March 2017. Image still: a1plusnews / YouTube. Some rights reserved. What is also clear, however, is that Tsarukyan’s appeal has its limits and that he is viewed as an embarrassment by more educated Armenians. In preparation for the elections, president Sargsyan moved to rebrand his Republican Party, bringing in a popular former Yerevan mayor Karen Karapetyan as prime minister and appointing his long-time chief of staff Vigen Sargsyan (not related) to the key post of defense minister. These moves have given the ruling party some boost ahead of April elections. Seven other parties and blocs are running in this election. The journalist-turned-politician Nikol Pashinyan has been a popular opposition figure and his bloc is third in pre-election polls. There is the bloc built around former defense minister Seyran Ohanyan that includes Raffi Hovannisyan and another former foreign minister Vartan Oskanian, as well as the recently jailed former Karabakh army commander Samvel Babayan; the bloc is widely seen as enjoying the backing of ex-president Robert Kocharyan. Then there are the mainstay “junior coalition partners” of the Republicans, the Armenian Revolutionary Federation – Dashnaktsutyun and the former Country of Law party, renamed Armenian Revival. But none appear to have the resources to compete with the Republicans and Tsarukyan and will struggle to cross the minimum thresholds to enter parliament, set at five percent for individual parties and at seven percent for blocs. Under the new electoral rules, if a majority coalition is not formed, a second round of voting would be called between the two top parties. This diminishes the ability of smaller parties to play kingmaker. Armenia’s political tradition calls for the main runner-up in elections to denounce them as fraudulent (there is usually just enough evidence for that) and call for street rallies to oust the “illegitimate government”. That is likely to serve as the main test for whether Tsarukyan is really opposed to the Republicans and so far it is unclear if he would follow that path. Emil Danielyan, a veteran Yerevan-based analyst of Armenian politics, believes that Tsarukyan has a tacit understanding with Sargsyan and may return into the government after the election or play the role of “constructive opposition” as in past years. Indeed, in recent days, Tsarukyan has hinted that a new coalition with Sargsyan would be possible under certain conditions. But Tsarukyan’s successful electoral performance may yet challenge this analysis. Armenians will then see who he stands for.